Click to view the current South Tipperary line train timetable (link to Irish Rail website). The station has a coffee shop, The Blue Beret Café (open 08.00-17.00 Mondays to Saturdays inclusive), waiting room (heated) and toilet facilities. Please see the News & Updates page for café menu. Rail and bus timetable posters are displayed in the waiting hall (pictured left) and there is a leaflet rack containing rail timetables. The station also has an eircom WiFiHub hotspot. A postbox is located at the front of the station building. There is platform seating, both sheltered and open-air. The entrance to the platform is via the gate on the right hand side of the station building. The platform may also be accessed via the station building (when the station building is open). The station has two platforms though only the platform on the station building side (platform 1) is normally used. 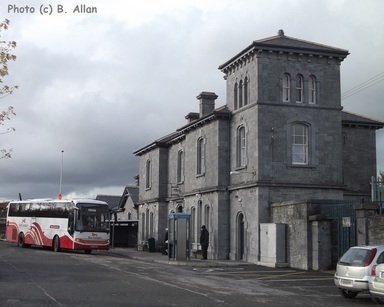 Clonmel railway station has an eircom WiFiHub hotspot. The eircom website has further info and may be visited by clicking on the logo. Several Bus Éireann routes serve the station. 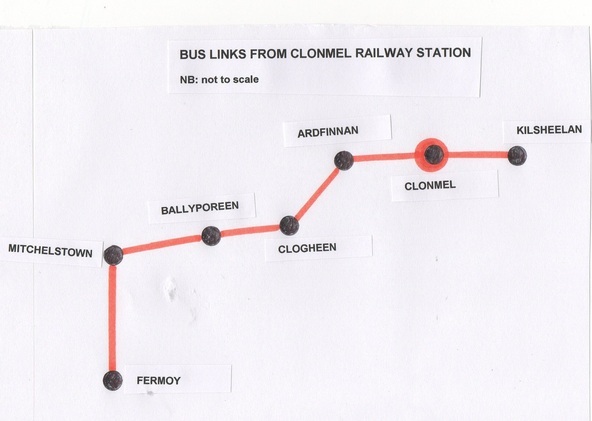 For Ardfinnan, Clogheen, Ballyporeen, Mitchelstown, Fermoy take Bus Éireann local route 245. There are several journeys daily. From Gladstone Street in the centre of Clonmel the Shamrock Bus Company operate routes to Thurles. Locations served along the routes include Cashel, Holycross, Fethard, Boherlahan, New Inn, Killenaule and Two-Mile-Borris. For full details of the routes and timetables please refer to the company’s website. 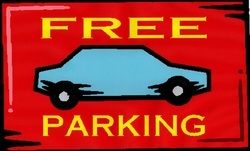 Parking is currently free of charge. It is possible to bring a bicycle by train. The InterCity train deployed on the line has a rack with space for three bicycles in one of its carriages. In the event of a smaller Commuter train being used a passenger should remain with their bicycle in the vestibule at all times. The carriage of bicycles is at staff discretion. The document below details rail & sea options from Clonmel to Britain via Dublin - Holyhead. Please click here to visit this website's page about travelling by sea & rail from Rosslare. Date of last update to this page: 1st December, 2015: update of fares info.